The most complete multi vitamin nature has to offer! AFA (Aphanizomenon-Flos-Aquae)— is a wild harvested Algae™considered to be nature's healthiest single food. Easy powder and capsule forms of AFA are great for traveling and camping. E3Live is the frozen/liquid form of AFA, which is superior to all other forms of AFA. E3Live is the only company to offer AFA in this fresh-frozen form. Ingredients:100% AFA blue-green algae. Capsules contain plant cellulose and water. Use my code RICH15OFF for 15% off your first order at E3Live.com! Use Algae powder/ liquid daily as a complete multivitamin. Use BrainON! Algae extract powder/ liquid as high energy and focus is needed. Our E3 AFA is a non-GMO heirloom variety. The beautiful, unpolluted Upper Klamath Lake-one of the few remaining alkaline lakes on the planet holds the key to its remarkable potency. Next to water, protein is the most abundant substance in a healthy human body. Proteins are made up of amino acids. There are 22 amino acids, 8 of which are essential and can only be obtained from our foods. AFA Algae contains more protein than any other organism (plant or animal). What is truly unique about the algae is that its amino acid profile is almost identical to that found in our body, making AFA one of nature's perfect foods. When improper amounts of amino acids are consumed, the less important body tissues are "cannibalized" causing premature aging and possible severe deficiencies, such as lack of motivation, loss of memory, low mental alertness, poor intellectual performance and depression. Chlorophyll’s molecular structure is almost the same as that of hemoglobin, which is responsible for carrying oxygen throughout the body. Oxygen is the prime nutrient, and chlorophyll is the central molecule for increasing the oxygen availability to your system. Chlorophyll is vital for the body's rapid assimilation of amino acids. Algae is the highest known source of chlorophyll. Vitamins do not provide energy, nor do they construct or build any part of the body. They are needed to transform food into energy. AFA contains a complete balance of vitamins except for vitamins "D" and "E". Spending time outdoors in the sun provides a source for vitamin "D", where it is formed in the skin by ultra violet rays. Eating high chlorophyll foods helps produce vitamin "E" in the body. Minerals have two general body functions - building and regulating. Without minerals, vitamins have no function. Minerals help build the skeleton and all soft tissues, and regulate heartbeat, blood clotting, internal pressure of body fluids, nerve response and oxygen transport from the lungs to the tissues. AFA contains almost every organic mineral in trace amounts, which is what the body must have to function well. Minerals can literally mean the difference between good health and serious disease. While the minerals only represent about one percent or less of our daily food intake, without them we cannot utilize our food, and we would quickly perish. The body uses beta-carotene to produce its own Vitamin A. It may well be the single most important factor towards enhancing the immune system (by protecting the thymus gland) and thus increasing our life span. However, the potential healing properties of beta-carotene are maximized ONLY when other precious carotenoids are also present. AFA contains dozens of carotenoids, all able to neutralize the deleterious effects of dangerous free radicals. Leading degenerative disease research authorities have shown that people who consume higher-than-average amounts of foods rich in beta-carotene have lower incidence of degenerative disease. *AFA contains a polysaccharide that stimulates the migration of immune cells in the body; the only natural compound known to stimulate immune cell migration. But the most extraordinary discover is the ability of AFA to stimulate stem cell release and migration, making AFA the first natural compound known to stimulate the natural innate phenomenon of healing, regeneration and repair in the human body. Aphanizomenon flos-aquae (Algae) is nature's most basic food. It exists at the beginning of the food chain, provides perfect nutrition and contains more protein than other whole foods. This amazing food can also help to purify the blood, promote intestinal regularity and naturally help heal the body. Good nutrition is the first step toward a long and happy life! Learn the Green Algae Smoothie Recipe Here! Use for at least 3 days before you know you have something high energy going on. 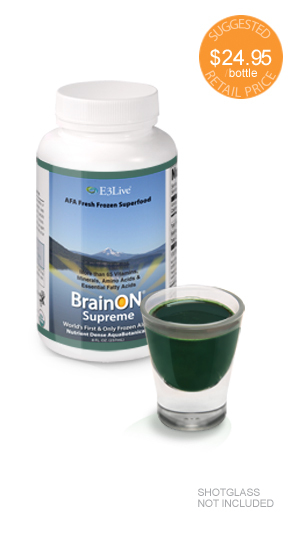 Concentrated extract of E3Live AFA Algae; fast, noticeable results, contrast to long time results with the regular AFA algae. Our convenient and easy powder and pill forms of BrainON are great for traveling and camping when refrigeration for freshfrozen BrainON is unavailable. Our proprietary extract of PEA from AFA is chemical free. Certified Organic. Vegan Gluten Free. No additives or preservatives. Available in vegetarian (no gelatin) capsules, powder, and freshfrozen liquid. Use my code RICH15OFF for 15% off your first order @ E3Live.com!